Arthritis associated with the inflammatory bowel disorders ulcerative colitis and Crohn’s disease is usually named enteropathic arthropathy. This arthropathy is seen in 10-15% of patients with these bowel disorders and may involve peripheral joints as well as the sacroiliac joints and the spine. Involvement of the sacroiliac joints as part of enteropathic arthropathy often presents more pronounced changes in the ligamentous part of the joint than seen in other forms of SpA. During periods with disease activity there can be pronounced inflammation which often heals with new bone formation. New bone formation can therefore be seen later in the disease. 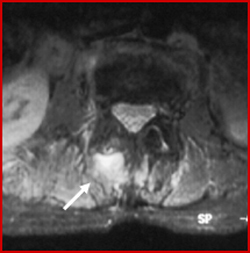 It is best visualised by CT.
Semi-coronal STIR image shows pronounced bone marrow oedema, predominantly located around the left sacroiliac joint (arrows). Semi-axial post-contrast T1 FS image more clearly shows that the inflammation (contrast enhancement) is predominantly confined to the ligamentous part of the joint (arrows). Semi-coronal CT showing new bone formation in the ligamentous part of the joints (arrow). Spinal changes can vary considerably, but are often somewhat similar to the changes seen in AS. However, there is usually a more pronounced osteoporosis than seen in other forms of SpA. This is due to the presence of bowel inflammation as well as the axial arthropathy. Sagittal T1 and STIR image. The T1-weighted image shows scattered fatty bone marrow compatible with osteoporosis. 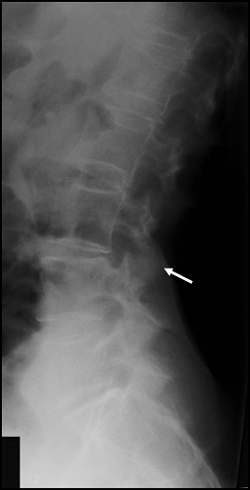 STIR displays bone marrow oedema localised to vertebral corners (arrows) in addition to posteriorly at the small synovial joints (apophyseal joints). Axial STIR image corresponding to the inflamed apophyseal joint showing oedema in the joint and surrounding soft tissues (arrow). Simultaneous radiograph shows pronounced osteoporosis. 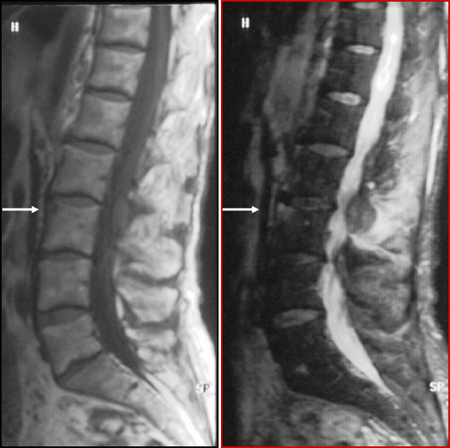 It is not possible to see the changes detectable by MRI although there seem to be some changes at the apophyseal joints between 3rd and 4th lumbar vertebrae (arrow).